BAD: Instead of spelling "lasers" with an "a" they spelled it with an "o"
BAD: The award is from the Trial Lawyers of America: "Most Likely to Maim"
"We've developed a new super-non-stick material that repels virtually all other substances. Our researchers plan to get right to work on applications for the material, just as soon as they figure out how to pick it up." 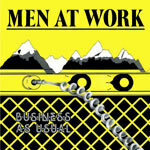 Album review: Men at Work blasted out of the Australian continent and onto the world stage with the album Business As Usual, carried in large measure by the mega-hits "Down Under" and "Who Can It Be Now?" But this album was solid through and through, with many other tasty tunes, such as the slickly produced "Catch a Star," the dreamy "Down By the Sea," the rough-and-ready "Touching the Untouchables," and the driving "Underground." The changes in pacing work nicely to keep the songs from sounding overly similar, and the album satisfies throughout. This is one 'ell of a debut album, mate.